Faculty members in all disciplines have debated for years whether students who use their laptops during class actually benefit. Some claim that permitting laptops in Internet-enabled classrooms leads to students distracting themselves with Facebook, email, Twitter, etc., rather than focusing on the lecture or discussion. I once visited an adjunct professor's class, and figured out that around 60% of the students were not using their laptops to take notes or do anything else related to that class. When I mentioned this to the professor, he was surprised, thinking that all the clicking of keys meant that students were taking copious notes. This was not the case. The ease of distraction has led some professors to switch off Internet access altogether during their classes, which has always seemed rather paternalistic to me. Law students are adults, and should be permitted to make their own decisions, even if the decisions are poor. The other concern about laptops in the classroom is that students, instead of participating in the class, become scribes who take down every word that is said and do not retain anything they hear. 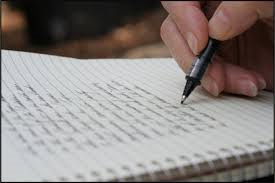 When I was a student, I always found that I learned best by taking copious notes by hand. I even chose my bar review course because it didn't have a lot of printed materials, but required students to attend lectures and take notes. Something about taking down the information by hand seemed to help me retain it. It wasn't just taking notes in class that helped me; I also went through my notes after the class and amplified and organized them. It was the only way I could truly master the material. A recent article in the Chronicle of Higher Education presents a study done by two researchers on students' note-taking preferences and supports those who believe that laptops are more hindrance to learning than help. The researchers found that laptop users took more than twice as many notes as students who wrote longhand, but that "While more notes are beneficial, at least to a point, if the notes are taken indiscriminately or by mindless transcribing content ... the benefit disappears." These findings will be published soon in an article entitled "The Pen Is Mightier Than the Keyboard: Advantages of Longhand Over Laptop Note-taking," in the journal Psychological Science. This article is sure to fuel the ongoing debate over laptops in the classroom. From the student perspective, I find other students' in-class laptop usage to be extremely distracting. I am constantly noticing what people are doing on their screens. This situation can be, to some degree, alleviated by choosing to sit at the extreme front of the classroom. Some classroom layouts make this strategy less effective.